Select a PayPal Credit help topic using the menu or use the search bar. If you don’t see what you’re looking for, please contact us. Applying for PayPal Credit is easy. Simply complete our short application form here and, if approved and once you accept the Credit Agreement, you’ll have a credit limit linked to your PayPal account almost straight away. 2. What if I don’t have a PayPal account? 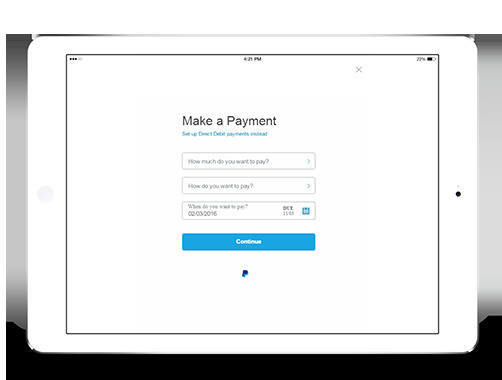 The first stage of the PayPal Credit application process will ask you to sign into your PayPal account or offer you the opportunity to sign up for one. 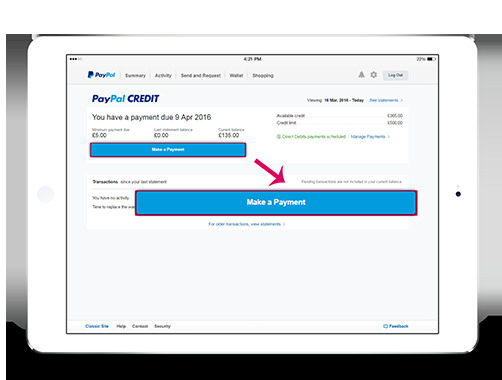 Once you’ve signed up for a PayPal account, you can begin the application for PayPal Credit. Click here to apply. 3. How long does it take to apply for/receive PayPal Credit? 4. I have a business account. How can I sign up for PayPal Credit? 1. What is PayPal Credit? 2. How does the 0% for 4 months offer work? 3. How do instalment offers with PayPal Credit work? With selected merchants, when you check out with PayPal Credit, we’ll show you a selection of instalment offers, enabling you to spread the cost of your purchase across a number of payments. Subject to application, merchant and status, these instalment offers allow you to choose a set number of monthly payments of differing amounts and at varying interest rates. If you already have PayPal Credit, you can take advantage of these offers without having to reapply as long as you have enough available credit limit. 4. How much will my credit line be? You can make a single payment from your bank account, debit card or PayPal balance at any time, online by logging into your account and clicking 'Make a Payment'. You can also make a payment by calling PayPal Customer Service on 0800 368 7155. Through customer services, we can accept payment via any debit card, even those not linked to your PayPal account. 2. How do I set up a direct debit? You can set up monthly direct debit payments, provided you have a bank account linked to your PayPal account. 3. When will my Direct Debit start? 4. I just opened up a PayPal Credit account, when is my payment due? We will automatically send you monthly reminders to notify you of when your payment is due. We’ll ask you to make your first payment around 35 days from when your PayPal Credit account was opened. 5. Can I setup payment due reminder alerts? We will automatically send you monthly reminders to notify you of when your payment is due. 6. How long does it take for payments to reflect on my account? 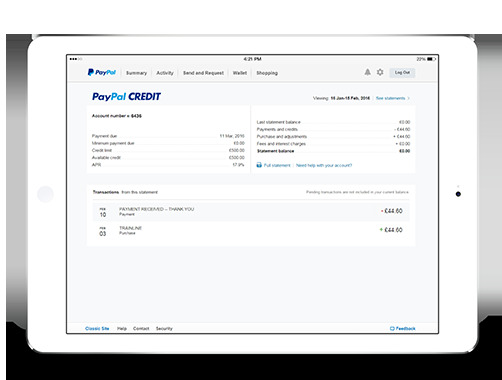 Payments will reflect on your PayPal Credit account the same day you make them. It may take a few days for your available balance to update and for the payment to show on your bank statement. 7. What if I can’t pay? 8. I’ve been using PayPal for a while now. How can I find out when my PayPal Credit bill payment is due? You can find this out by logging into your PayPal account on a desktop computer and by clicking on the summary page. You can also view when to make a payment via the app. Click on PayPal Credit and the ‘Make a Payment’ button. 1. How do I manage my account? 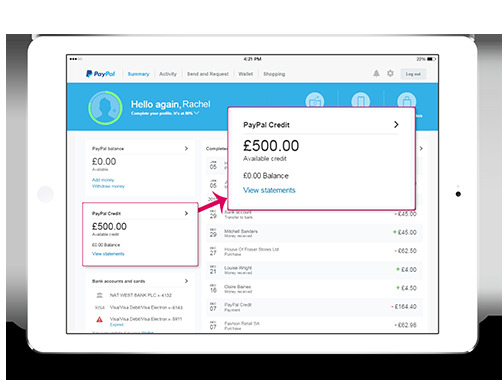 You can keep track of your PayPal Credit activity and history by logging in to your PayPal account and selecting PayPal Credit. 2. Where can I find my statements? We will email you monthly to let you know when your latest statement is ready to view. 3. How can I update my contact details? 4. How do I close my PayPal Credit account? Before you close your account, you need to ensure that your balance has been paid off in full. To close your account, you can call our PayPal Credit customer service team on 0800 368 7155. 1. Where can I use PayPal Credit? 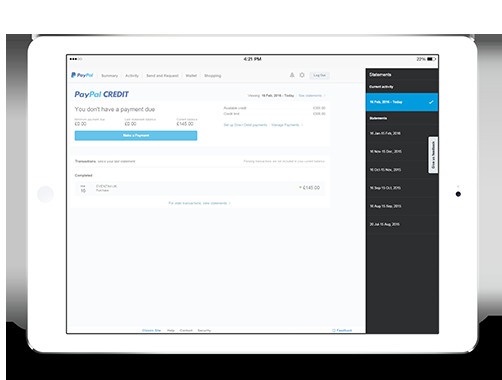 PayPal Credit is available to use at thousands of stores online where PayPal is accepted. Transactions in GBP Only. We also offer instalment offers at select merchants. 2. How do I select PayPal Credit as my funding source? On those merchants where instalment offers are available, remember to lookout for PayPal Credit at checkout to see the offers available to you. 3. Will I receive alerts on my mobile phone for transaction made on my account? 4. Are there any businesses or types of goods for which I cannot use PayPal Credit? There are some business categories where PayPal Credit cannot be used as a payment option, so it won’t be offered to you as a payment option during checkout. Excluded categories include merchants selling adult content, stored value cards, and gambling. 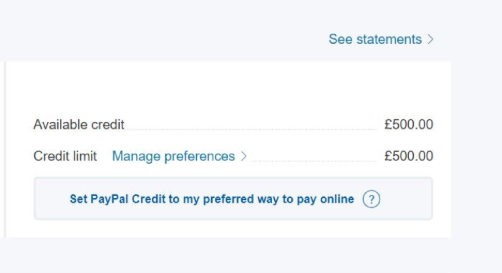 You can only use PayPal Credit for transactions in GBP. 5. Can I transfer money to family and friends or my bank account using my PayPal Credit? Currently, your PayPal Credit limit cannot be used to send money to friends and family or to deposit funds into your bank account. 6. Can I get cash with my credit account? Currently, your PayPal Credit limit cannot be used for a cash advance. 7. Can I use my PayPal Credit for “Invoice" or "Money Request”? PayPal Credit will not be available as a funding source to pay an invoice or money request sent via PayPal. 8. Does PayPal Credit protect me from unauthorised charges? Yes. You’re not liable for unauthorised purchases made from your PayPal Credit account. 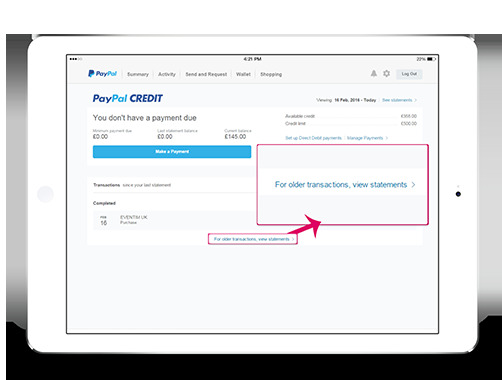 PayPal Buyer Protection also applies to purchases funded with PayPal Credit. If this happens, you should immediately report it to us so we can investigate and resolve it for you. You can report an unauthorised transaction through the Resolution Centre of your PayPal account. This is independent of any other statutory rights you may have. Under 'More about your account', click Resolve a problem in our Resolution Centre. Select the item you wish to dispute, Click "Continue", and follow the rest of the instructions provided to submit your dispute. 9. I have upgraded to a business account and now I can no longer see all of my PayPal Credit information/ functions, why is this case? 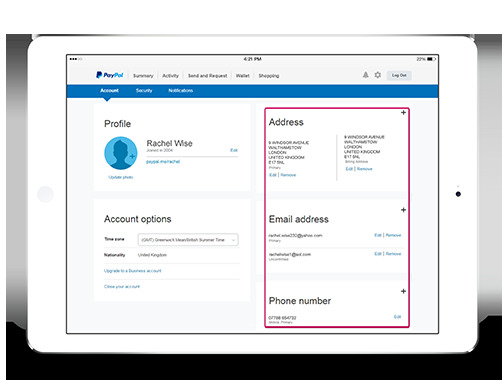 You can access the PayPal Credit hub through your Business account. 1. Are there any fees I should be aware of? 2. Is there an annual fee? No. There is no annual fee for a PayPal Credit account. 1. What is persistent debt? Persistent debt is defined as any customer who pays more in interest, fees and charges than they repay of the amount they borrowed (known as “principal”) over a rolling 18-month period (with a balance greater than £200 GBP during that time). We will notify you if you consistently fall into this category at 18, 27, 30 and 36 months. 2. I’ve received a letter stating I’ve paid more in interest, fees and charges than principal over the last 18 months. What does this mean? 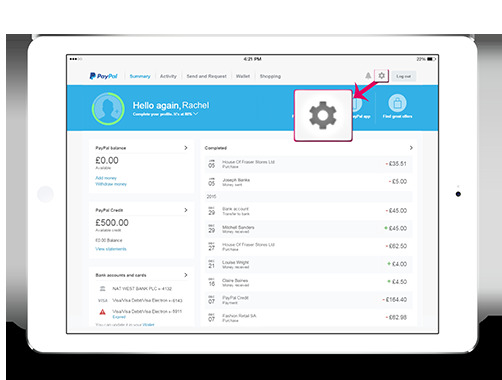 As a responsible lender, PayPal monitors the repayments of our customers. We look for signs of potential difficulty and try to recognise where improvements can be made. In this instance we’ve identified that if you increased your repayments you would repay your debt more quickly and reduce your interest costs. 3. How can I increase my payments? PayPal Credit offers a few different ways for you to make payments. You might consider setting up a Direct Debit, which is an easy way to pay the amount you choose automatically rather than having to make them manually yourself each month. To set up a Direct Debit or change your existing Direct Debit, log in to your PayPal account. Alternatively, you can make or schedule an additional payment in your account by following the link above and clicking the “Make a Payment” button. You can also make a payment by calling 0800 368 7155. 4. What do I do if I can’t afford to increase my minimum payment? If you don’t think you’ll be able to increase your payments because of other financial commitments, you can call us on 0800 368 7155. We’d like to help and can talk you through the options that may be available to you. We’re open 8.00am to 8.30pm Monday to Friday, and 8.00am to 6.30pm on Saturdays and Sundays. 5. Where else can I go for financial help and support? The Money Advice Service provides free and unbiased information and advice about financial services. They can be contacted by phone on 0800 138 7777 and by email at enquiries@moneyadviceservice.org.uk, or alternatively, via their website: www.moneyadviceservice.org.uk/en. If you live in Scotland or Northern Ireland, please consider www.moneyadvicescotland.org.uk or www.debtaction-ni.net respectively. 1. How do I increase my credit limit? We review your credit limit monthly and may invite you to increase your limit once you’ve been a PayPal Credit customer for at least 3 months. You can always request a credit limit decrease or opt out of receiving offers to increase your credit limit. 2. Can I apply for a credit limit increase? No. Unfortunately, you cannot request a credit limit increase. Credit limit increases will be offered to you when you become eligible. 3. What are the eligibility criteria for a credit limit increase? Have transacted with PayPal Credit in the last 6 months. 4. How do I change my credit limit preferences? 5. My credit limit has increased automatically. How can I reduce this back to its original limit? You can change your limit back to its original limit at any time by calling PayPal Credit Customer Service on 0800 368 7155. 6. If I change my preferences when I have a pending credit limit increase offer, will it apply to the pending offer? No, your new preferences will apply to all future offers only. 7. What options are available to me for credit limit increases? Automatically accept all credit limit increases. This means any future credit limit increase that is offered will be applied automatically to your account. Manually accept or decline each credit limit increase. This means that when an offer becomes available to you, you will need to log in to your account and accept or decline the offer yourself. Turn off credit limit increases. This means you will not be offered a credit limit increase even when you become eligible. 8. Can I increase my credit limit increase before the offer expires? 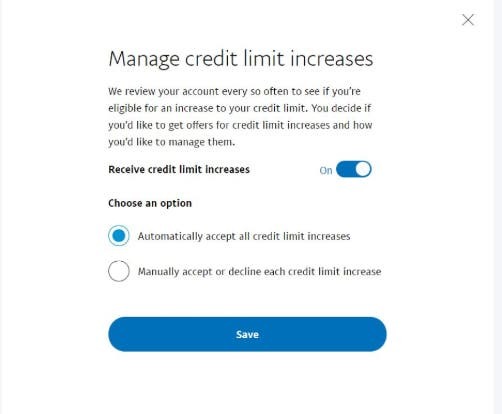 Yes, when you are offered a credit limit increase you can choose to apply it to your account straight away or at any time before the offer expires. 9. My credit limit increase offer has expired. Can I still get it? No, once an offer has expired you’ll need to wait until your next offer. We review your credit limit monthly and will continue to offer you a credit limit increase as long as you meet our eligibility criteria. 1. I have been declined for PayPal Credit. Why? We’ll email you with more information about why your application for PayPal Credit was unsuccessful. If you apply during check out and get declined for PayPal Credit, you can still use PayPal to check out securely with your debit or credit card. If you want to re-apply, you will be able to 35 days after your last application. 2. What is a Representative APR and what is the Representative APR for PayPal? A Representative APR (Annual Percentage Rate) is shown on products where you borrow money so that an easier and fairer comparison can be made. It’s the typical total cost of a credit product expressed as a percentage, spread over 12 months. The Representative Annual Percentage Rate for a PayPal Credit account is 19.9% (variable) per annum. This is also the standard rate of interest that will apply to your purchases. 3. What does subject to approval mean? We are required to carry out creditworthiness and affordability checks to determine if PayPal Credit is right for you. As part of this process, we review information held on you by credit reference agencies and other relevant information prior to approving you for PayPal Credit. 4. Is there a cooling off period if I want to close my PayPal Credit account? You may withdraw from your PayPal Credit account by calling us within 14 days of entering into the Credit Agreement. You may close your PayPal Credit account at any time, but must repay any outstanding balance. 5. What currency does PayPal Credit Support? PayPal Credit can currently be used to purchase items in Pounds Sterling (GBP). 6. I accidently used PayPal Credit for a purchase how can I clear my purchase. The first option is to contact the merchant and see if they can cancel the order. If it’s too late for the merchant to do so, then you can return the goods to receive the refund direct to your PayPal Credit account. 7. Does PayPal Buyer Protection apply to my PayPal Credit purchases? Yes. If an eligible item that you’ve bought online doesn’t arrive or doesn’t match the seller’s description, PayPal Buyer Protection will reimburse you. Buyer Protection covers all your PayPal purchases including those paid with PayPal Credit. For full information on eligibility, see our User Agreement. 8. What is the difference between Pay After Delivery and PayPal Credit? Pay After Delivery is a payment method that we’re offering to selected customers, where you don’t pay for your item until after you’ve received it. We pay the seller immediately, so they can send you the item straight away, but we wait for 14 days before we debit the money from your bank account. This gives you time to receive and view your item before you pay. If the item doesn't arrive or isn't what you expected, you’ve 180 days from the transaction date to report a problem as usual. Our Buyer Protection can cover you for eligible items. 1. How can I contact you if I have any further questions? For more information, you can call PayPal Customer Service on 0800 368 7155. Alternatively, if you’re an existing customer you can use our secure message centre for all account related enquiries by logging into your PayPal Account.